You'll be £14.99 closer to your next £10.00 credit when you purchase King's African Rifles: A History. What's this? Whatever one may think about the rights and wrongs of colonial rule, it is hard to deny that during the first half of the this century those African countries, which then came under British administration enjoyed a period of stability which most now look back upon with a profound sense of loss. Paradoxical though it may seem, one of the bulwarks of that stability was each country’s indigenous army. Trained and officered by the British, these force became a source of both pride and cohesion in their own country, none more so than the King’s African Rifles. founded in 1902 and probably the best known of the East African forces. In this, the first complete history of the East African forces, Malcolm Page, who himself served in the Somaliland Scouts for a number of years, has had access to much new material while researching the history of each unit from it’s foundation to the time of independence. Historians in several fields will be grateful to him for having put on record this very important period in the annals of both Great Britain and East Africa while the memories of many who served there were still fresh, and they themselves will perhaps be most grateful of all for this lasting tribute to the men they served and who served them, for in that shared sense of duty lay the true spirit of East African Forces. 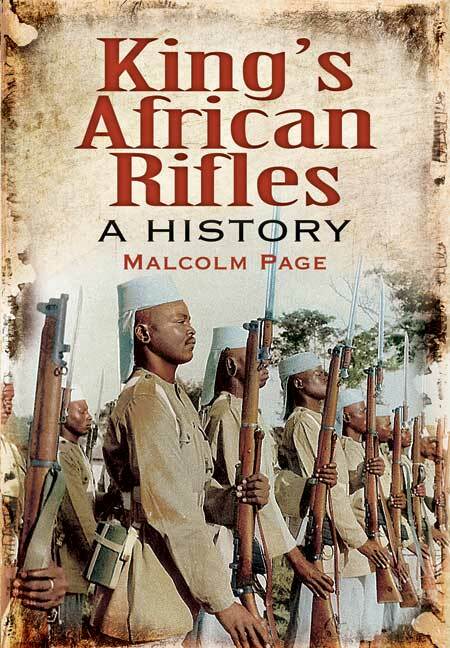 Much of the book covers the achievements of the King's African Rifles during the two World Wars. The KAR took part in the long campaign in East Africa during the First World War, and fought against the Italians in Somaliland and Ethiopia, against the Vicky French on Madagascar and against the Japanese in Burma, performing well on each occasion, during the Second World War. These sections, and the chapter on the Malay Crisis, are presented as narratives, with the KAR's involvement set against its historical background. The potentially more controversial chapter on the Mau Mau is rather different - a short outline of events is followed by a series of personal memories of the fighting. The same approach is taken for the chapter on the end of Empire. These final chapters are thus less detailed, but give a better feel for the nature of life in the unit. There are also some interesting appendices, in particular the discussion of the songs of the King's Africa Rifles. This is a useful study of a part of the British army that is now receding into the past, with most of its regiments going in the early 1960s, half a century ago. In the King's African Rifles: A history of the King's African Rifles and East African Forces, Malcolm Page, a retired British Army Brigadier General and veteran of the Somaliland Scouts, presents us with the first complete account of the history of the King's African Rifles (KAR). Created on 1 January 1902, the KAR would, by the time of its final disbandment in 1964, form the core military capability of the armies of at least five newly independent African states, namely Malawi, Zambia, Kenya, Uganda and Tanznia. This book serves as the first port of call for most serious readers interested in the Regiment's history. A constant thread throughout the book is the affection and pride members of the KAR display towards the regiment as well as fellow members and veterans. All in all, Page's book is an excellent introduction to arguably one of the most influential regiments in the history of the African content. As such it comes highly recommended. In the first complete history of the East African forces, Malcolm Page, who himself served in the Somaliland Scouts for a number of years, researches the history of each unit from its foundation to the time of independence. THE King’s African Rifles (KAR) are recognised as one of the most effective colonial units formed under British administration. The author has produced a detailed and well-illustrated history of what has been until recently a much overlooked regiment. The officers and soldiers of the KAR fought in both World Wars and were deployed far beyond East Africa. They also figured prominently in the post-war guerrilla conflicts that preceded the British withdrawal from Africa. This comprehensive and complete history charts the story of the East Africans from their formation in 1902 through to the drawdown of the British Empire.